THE TRUTH ABOUT MARY'S VIRGINITY. "THE REAL GENEALOGY OF JESUS"
Mary's virginity, is one of the many issues in which the Church has falsified the truth, believing that a miraculous birth would exalt even more the image of Jesus. 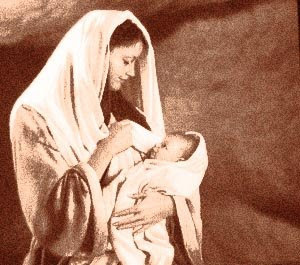 Mary didn't have any privilege over other women. And neither Jesus, we are all the same when we are incarnated. Mary married to Herod Antipater when she was a 15 year-old girl, Herod Antipater was, one of the sons of the king of Judea Herod Antipas (Grandfather of Jesus), He had inherited the throne from Herod I the Great (great-great-grandfather of Jesus). Mary’s wedding was carried out secretly, there were only few witnesses. Mary and Herod were in love with such great spiritual Love that their only desire was to be together, their love was so sublime that Mary, like one commonly says, “She gave herself to him in body and soul”, (this coincides with the writer and investigator Robert Graves who speaks in his book "King Jesus" about the relationship between Mary and the prince Herod Antipater) She was virgin then, this is the real virginity of Jesus’s mother. After Herod Antipater made Mary pregnant, he had to escape from the region because his father Herod Antipas,- a sick person physically and spiritually- was convinced that he wanted to dethrone him, then he persecuted him to kill him. Moreover, the other brothers of Herod Antipater were fighting for that Kingdom also. Herod Antipater was betrayed by men he thought were trustworthy, at least he trusted them. His brothers found the place where he was hiding; he was caught, and imprisoned in a dark jail, few days later he was murdered by order of his father. After that, his brothers fought for the part of the inheritance that Herod Antipater had left. The intrigues continued and two years later when Herod Antipas died, the Kingdom of Palestine was divided among his sons as a result, they ended up fighting among them to see who had the right to possess the king's crown. But who was the legitimate king...? Yes, Jesus the son of Herod Antipater was the legitimate King! This was never recognized. In any case, Yeshua - Jesus’s Real name- didn't care about that earthly Kingdom. His mission was another and we all know that he accomplished his mission successfully. Interlocutor: I want to know first, since it’s a question that many people have asked me, Where did we come up with the idea that Mary, the mother of Jesus, married legally to Herod Antipater and He was the real father of the Master Jesus. Concretely, I want to know if there is some place on Earth where we could find a document to proof unquestionably this revelation. Ruanel: There are no documents because that marriage was something beautiful but very private. It was the fulfillment of a very great love between them. In History, many writers have invented wonderful love stories, as Romeo and Juliet, Orpheus and Eurydice. However, the love between Mary and Herod Antipater outshines any other love story in History because it was sublime. Interlocutor: I understand perfectly what you are trying to tell me. Not even in the Bible appears that marriage at least reading between the lines? Ruanel: No, because the Bible is a very oppressive book, and in no case it would have admitted that a virgin had a secret love, and they in fact were husband and wife. Interlocutor: In the Vatican files, Isn’t there anything either? Perhaps they have documents and they are hiding them. Ruanel: No, I repeat NO, because the marriage was secret and it was not recorded on any paper. It was even concealed even by Joseph himself. It doesn’t mean that there are Papyrus where there is reference about this fact, but those documents are not evidence, but mere indications with no real value, even if the names appear−Miriam, Antipater, Jesus− They will never accept that these names are related to the real protagonists. When Jesus fought hand-to-hand his stepbrothers  in the clever art of the sword and the spear, he took it as a game, strengthening his muscles. He never inflamed because he did it with love. Jesus loved everybody. At the time at which he discussed in the temple with those doctors of law, teaching them the true interpretation of the Torah, the fool doctors were offended because they could not accept that a teenage boy could teach them. Oh, fools, fools! How patient had to be my Jesus! He bent his head and said to them: "Excuse me, gentlemen, if I have offended you." But within his spirit he said: "Idiots, stupids, they are never going to learn! Some time later he went to study with the Essenes. But he was very opposed, particularly by a teacher of justice that was very selfish and did not want anyone to dim him. He did not accept how Jesus was. That teacher of Justice said that those who taught were not to be permissive, but rigid. They neither accepted the innovative ideas of the new disciple, because they believed in an imminent end of the world, where would be only saved those who retain an ascetic life. When that teacher disincarnated, a worse one replaced him. After that, poor Jesus stopped trying to change that community so closed of ideas and left the site. Archangel Gabriel: Mary did not have much knowledge, but had a lot of wisdom which used with her son. She knew that Jesus was a special being. Mary knew the Torah by heart. But she was a woman, and we know that at that time women were disregarded. Jewish customs used to mistreat women in general. I give an example, a farmer who finished eating a lamb leg and had his hands full of fat, called the eldest daughter and had his hand cleaned of fat in the long hair of the girl. It seems aberrant what I say, but it was real. Moreover, when the girl had grown up, her family looked for ways to get rid off her by "trapping" the first candidate who crossed to marry her. But the father of the boy, who was no fool, requested a compensation for taking the "burden." After many discussions they agreed the price and arranged the wedding. Interlocutor: Did Mary have more children? Archangel Gabriel: Yes, she had three sons with Joseph. In addition, Joseph had three sons from his previous marriage. This doesn't affect the image of Maria, the truth about how she became pregnant Mary, at no time, committed what in those days was considered "sin". She never committed adultery. She had a legitimate husband. And then she had a second husband, the good Joseph, who also was her tutor. Interlocutor: The church wants to show the birth of Jesus as a divine intervention of the Holy Spirit, which I think is nonsense, because Jesus said that he had come to enforce the law, not to destroy it... Why making a miracle away from the laws of physics? Archangel Gabriel: The miracle existed, in the sense that my beloved Jesus has conveyed the greatest message of love of all time: "Love each other and love your neighbor as yourself." Jesus has given much wisdom to anyone who has wanted to listen. Unfortunately many do not listen and prefer to be in ignorance. Greeting with all my love, I will give way to another entity. The cruel Archelaous became the Ethnarch of Judea and Samaria, the lavish Herod Antipas, tetrarch (circa 'ruler of a quarter') of Galilee and Perea; Philip received the north-east of the realm and was styled tetrarch. This entry was posted at Monday, July 20, 2009 and is filed under Biblical mysteries . You can follow any responses to this entry through the .